Mensusa https://www.mensusa.com/articles/colorful-sport-coats-are-wardrobe-essentials.html Colorful Sport Coats Are Wardrobe Essentials The sport coats that are in fashion now are the colorful sport coats. Sport coats like suits have been one of the essential outfits of sophisticated men for ages. They were previously considered as casual wear. But later they became an alternative to the suits that men wore to their workplaces. The versatility of the sport coats made them more popular as fashion trends moved on. These coats are made from the finest fabrics like wool, linen or silk and the bright colors and patterns create an amazing look to the traditional sport coats. The various shades of the coats give you the opportunity to wear them throughout the year on all occasions and seasons. These coats are practical outfits that are never out of fashion. Every man wants to dress up well and be appreciated wherever he goes. Hence it is absolutely necessary that you own a few of the colorful sport coats to flaunt your style and look handsome on all occasions. A navy sport coat is a timeless addition to your wardrobe. You cannot also ignore the new shades that are trendy nowadays like the burgundy or the yellow and red sports coats. Actually you need to select the color according to the time of year as well as the event. 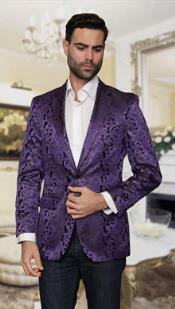 When you enjoying with friends and family your bright colorful sport coats will be absolutely right. Whereas, if you want to stay cool and yet look dressed up at your workplace, the navy blue or the white and black sport coats will be just fine. You can wear the matching dress shirts to look smart and dignified. The uniqueness of the colorful sport coats of today is that they are mostly light-weight that allows you to stay comfortable for long hours. Since these are tailored outfits, you are sure to get the perfect looks. Visit mensusa.com for all your requirements regarding these colorful sport coats as the store offers a marvelous collection of designer sport coats of innumerable colors and cuts to cater to the preferences of all customers. Apart from silk, linen and wool, colorful sport coats are available in hounds-tooth pattern or the windowpane pattern also. These have a traditional look and the colors add a different charm to the attire. Patch pockets and metal buttons of gold add a touch of royalty too. When you wish to look bold and confident, go for the chino cotton sport coats in brighter shades because this fabric can hold the colors and at the same time offer a matte finish. Golden mustard or deep tangerine shades look great. The plaid sport coats offers a classical look and so the traditional colors look best. For the summers, a blend of silk and linen gives you absolute comfort and maintains your style. You can also opt for the western colorful sport coats or those made of leather. The Italian sport coats add a feather to your collection. These colorful sport coats add sophistication and informal stylish looks to your entire appearance that can make you stand out of the crowd always.